Nice work. 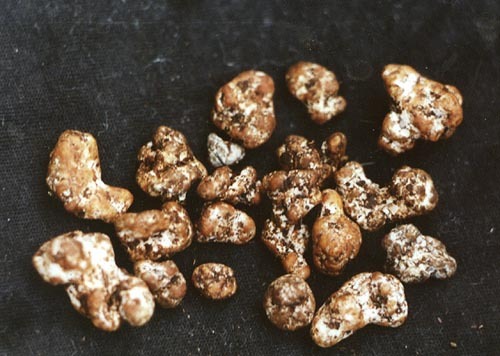 But the real test is invitro sclerotia formation. So far the "B" strain preforms poorly in that regard but fruits well and usually forms sclerotia in the casing. I am testing the "A" strain now which was isolated from a genetically different fruitbody. I should have results in 6 weeks. Good to see you are still around, I was beginning to wonder. Good luck with the samuiensis. Good work B.I.O.!! I too was curious of your presence here. They look exactly like the ones that we grew. But we found that sclerotia like these are only formed in the casing layer. In jars they start out but don't develop. Although we have tested numerous substrains we have not found a clone that develops nuggets like these in jars with grass seed (tampanensis-style). We found that substrains that were good mushroom-producers produced little or no slcerotia and vice versa. 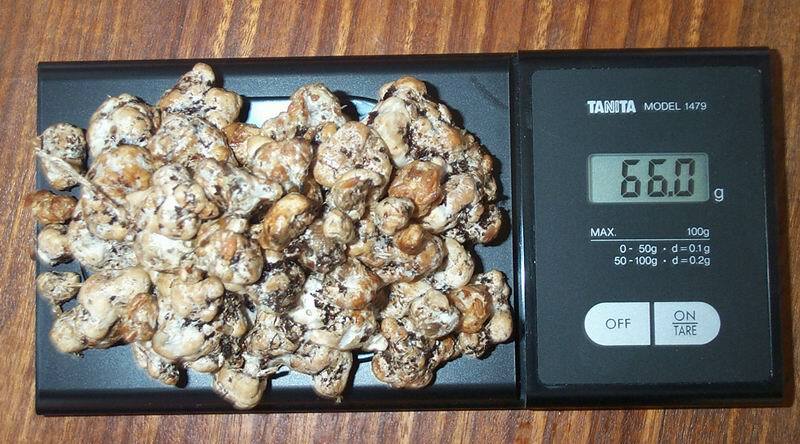 The picture shows the yield from one casing (110 grams of grass seed, 180 ml water, peat/lime casing). This substrain produced only a few mushrooms. i hope my samuiensis cake fruits soooooon! didi u ever got back my reply??? Can someone explain to me what the hell they are! And whats so good about them? those are sclerotia, basically mycelium potatoes. of course you can trip with those, the high is mellow than mushrooms...and you don't need a terrarium to grow these, just jars. What are people doing to select a substrain that shows rhizomorphic growth? 1,328 topic views. 0 members, 4 guests and 1 web crawlers are browsing this forum.